Level Structures are made of interlocking aluminium spirit levels. Artworks in this series are assembled and then later remade as new configurations. Slotted horizontally or vertically into position each spirit level is aligned to display a perfect state of equilibrium, the resulting sculpture being harmonious with the laws of gravity that govern all construction. 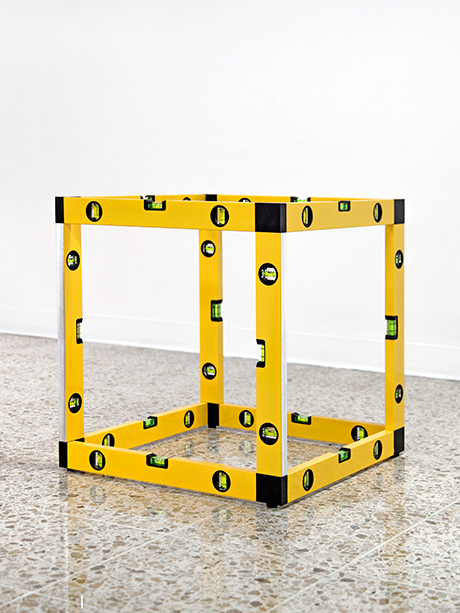 The project is informed by the aesthetics and high ideals of American Minimalism, whilst the multiple mass-produced spirit level might also suggest the significance of the readymade. Moreover, being methodically assembled following a set of plans and instructions, Level Structures are characterised by the egalitarian principles of Do-It-Yourself culture and the influence of modular contemporary architecture.